I was sitting in a barber's chair one day when a young mother brought her little boy into the shop. One of the barbers fixed up a special seat for the youngster and placed him in it. Thus far, everything was done very peacefully. 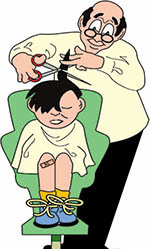 But the minute the barber began to clip the boy's hair, the youngster screamed at the top of his voice. The mother tried calm him. But to no avail. We all feared that we were in for a half hour of torturous bawling. Then the barber bent down and whispered into the boy's ear. The bawling began to quiet down and finally stopped completely. The barber worked fast. In a few minutes the neatly clipped youngster left. He and his mother were both smiling. The customers in the shop felt a sense of relief. I was intrigued by what had happened, and before I left the shop, I asked the barber what he had whispered in the boy's ear. "I asked him to close his eyes," he said, "so that none of his hair would befall into his eyes. I have found that children cannot cry with their eyes closed." In any case, the barber's approach to the problem was psychologically sound. Getting the boy to stop crying was delicate, but the barber did not approach it directly. If he had merely asked the boy to stop crying, his words would have had little effect. Instead he asked him to close his eyes. The boy cooperated and the crying stopped. The approach was indirect, but it worked. Many problems in life must be dealt with in this matter.